subroutineTrace – If successful, give the Runner 1 tag. subroutineTrace – If successful, the Runner accesses 1 fewer card whenever he or she accesses cards for the remainder of this run. How long does the effect of the second trace on SYNC BRE last? 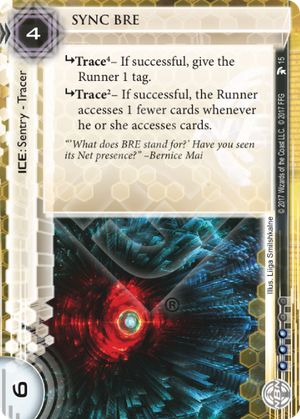 Designer's Note: Technically, as SYNC BRE is written this effect lasts until the end of the game, but it should read: "Trace2 - if successful, the Runner accesses 1 fewer card whenever he or she accesses cards for the remainder of the run." If SYNC BRE’s second trace resolves during a run on Archives, how will the access step be affected? Just like normal, the Corp flips all facedown cards in Archives faceup, then the Runner accesses cards in the order of their choice. The Runner will not be able to access the last card, so in practice this means the Runner chooses a card to not access. If SYNC BRE’s second trace resolves during a run on a remote server, how will the access step be affected? What if there are multiple cards installed in the server? Just like normal, the Runner chooses the order they will access the cards installed in the remote server. If there is only one card installed in the remote server, then the Runner does not access that card. If there are multiple cards installed in the remote server, the Runner chooses and accesses one card from the remote server at a time. The Runner will not be able to access the last card, so in practice this means the Runner chooses a card to not access. If SYNC BRE’s second trace resolves during a run on a central server that has upgrades installed in its root, how will the access step be affected? If SYNC BRE’s second trace resolves during a run initiated by Information Sifting, how is the access step resolved? Just like normal, the Corp separates HQ into two piles, the Runner chooses one of the piles, and then the Runner accesses one card at a time from the chosen pile. The Runner will not be able to access the last card in the pile. A suboptimal tracer at a reasonable cost. The first subroutine is a decent but not great tax. Runners tend to pack a bit of link these days so let's assume 2. That means 2 to skip the tag or otherwise 2 and a click to get rid of the tag (and giving a window for things like Zealous Judge. The second subroutine is situational. If SYNC BRE is placed in front of a scoring server with an agenda installed and the runner doesn't break subs and the scoring server has only one card installed and you have more money than the runner it lets you pay to save your agenda for one run. However unless you're facing an unprepared runner the second sub at least will be broken. The runner could also choose to let you pay to boost and just use their resource advantage later. And how often will your scoring server not have two cards in it (cough SanSan City Grid cough)? Strength 6 is nice and could catch the runner by surprise, but these subs are unlikely to do much harm. For 3 credits more you can get Thoth which has the same subtypes and strength but is almost guaranteed to give the runner a tag. At the same cost there's Data Raven which tags the runner unless they jack out and has a really nasty subroutine on it (give the runner a tag when the corp wants to). For a stronger trace-for-tag but one that's not as guaranteed to fire (3 strength) Turnpike fits the bill and is way more economical to boot (2 and the runner loses 1 on encounter). Would I put it in a competitive deck? No. Would I put it in a casual deck? Nope. Would I put it in a jank deck? Nah, not over-the-top enough. Would I put it in a deck if my opponent and I play the deck the other assembled? Maybe. But it's perhaps a bit too strong for that.